Want a cheap coffee machine deal to brighten up your February? Whether you're on the hunt for a top-of-the-range coffee machine or just a budget all-rounder, it's definitely worth shopping for at a discount. Obviously, you want a top of the range coffee machine for the cheapest price, right? Well, we've got the best cheap coffee machine deals right here – from pod to espresso machines and even filter coffee machines. Head to our deals page for the latest on all things discounts and deals. Want to upgrade from your slightly worse for wear cafetière? 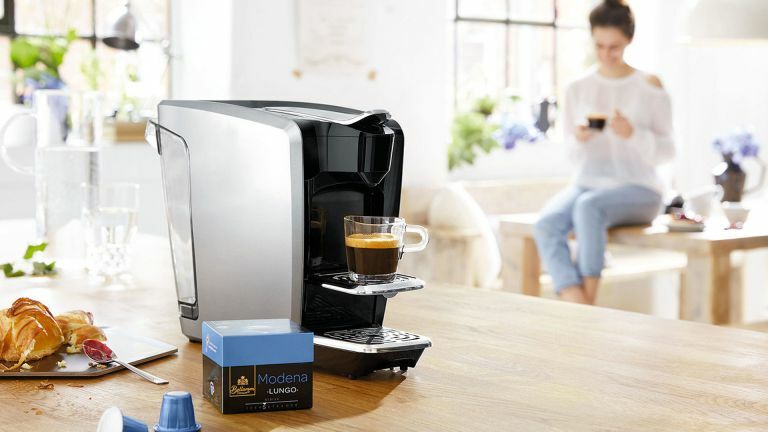 Get an amazing deal on a swanky new coffee machine. This De'Longhi Lattissima Touch even has a personalised drink option to memorise amount of coffee and milk required for your favourite drink. If you didn't find the coffee machine deal you was after above, don't worry, we've got tons more cheap coffee machine deals below. Is my new coffee machine right for me? Whether you're a coffee aficionado or just like to have a coffee to help you out of bed in the morning, we can advise you on the best coffee machine to buy. If you're a lover of American-style coffee, you prefer to make a pot of coffee rather than a cup, and you ideally want a machine that's cheap to run, opt for a filter coffee machine. Not only are they easy to use, they're more often than not reasonably priced, and ideal for large households with several coffee drinkers. If you often spend your mornings in a rush, are stuck for worktop space or you like to experiment with your coffee, the pod coffee machine will suit you: simply pop in a pod, press the button and within seconds out comes your drink. They're more often than not compact, can make several different drinks and flavours, and many models are smart, meaning you can get your coffee going by using an app on your phone. Known for your love for espresso? A pump machine should be your next purchase. If you want silky coffee (who doesn't? ), these machines let you grind, tamp and craft your own coffee. They do come in automatically operated versions too. If you're an experienced coffee drinker, then we suggest you splurge on a bean-to-cup-coffee machine. They're the easiest way to make several drinks at one time, and it's all fresh and of the best quality. It'll definitely impress guests, too.